ONE OWNER **, BLUETOOTH/ HANDS FREE CELL PHONE **, SERVICE RECORDS AVAILABLE **, NEW TIRES **, TWO SETS OF KEYS **, Suburban 1500 LT, 4D Sport Utility, Vortec 5.3L V8 SFI Flex Fuel, 6-Speed Automatic Electronic with Overdrive, 4WD, Graystone Metallic, Ebony w/Custom Perforated Leather-Appointed Seat Trim. 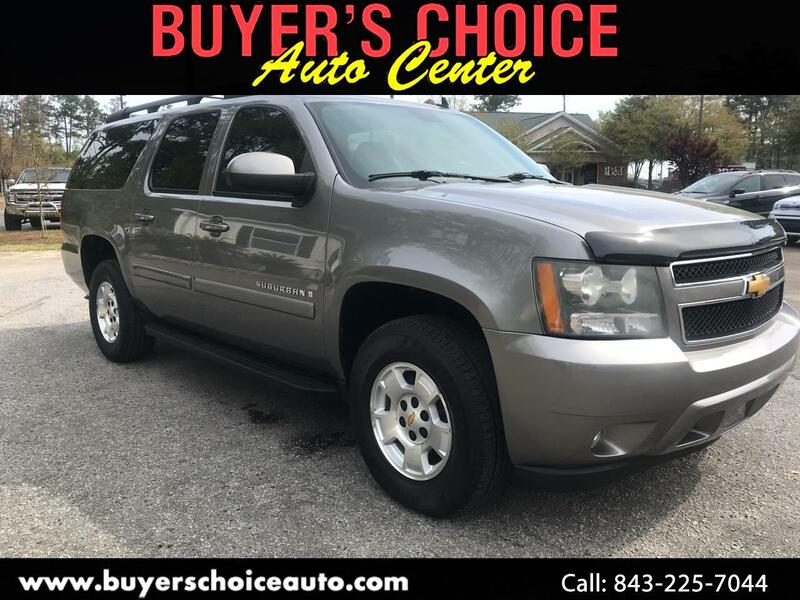 Graystone Metallic 2009 Chevrolet Suburban 1500 LT 4WD 6-Speed Automatic Electronic with Overdrive Vortec 5.3L V8 SFI Flex Fuel Odometer is 28613 miles below market average! Buyer's Choice Auto Center is family owned and operated pre owned car dealership located in the heart of Summerville, SC. We have been in business for over 15 years this April. Larry McLain and his wife Laura do it all here at Buyer's Choice. Buyer's Choice specializes in rare late model Land Cruisers, and Land Rovers. We also carry a great selection of pre owned vehicles, and we price them very aggressively. Most of our vehicles are sold at or under trade in value. That is because Larry does all the buying at auctions himself. Please feel free to contact us or stop by the dealership anytime to check out our amazing inventory. We have some of the most unique inventory in the Charleston area!!!! Be sure to visit our virtual showroom of inventory available for purchase. There you will see detailed information about each vehicle, a picture gallery, as well as convenient ways to contact us for more information about that vehicle. We are located at 902 N Main St and are available by phone at 843-225-7044 . You can also get driving directions and hours of service from our user friendly website https://www.buyerschoiceauto.com/ .